By Skyhawk to Florida – Day 8 – Back home! – EHFC Members Talking! When we arrived at Cape Isle Airport (a/k/a Odell Williamson or 60J) and fueled 46493, we discovered that the left-hand fuel cap was missing. Either the line crew in St. Simons forgot to put it back after they fueled the airplane, or they’d put it on loose and it vibrated off. I’d prefer to believe the latter, but I have to admit I didn’t check to see if the cap was there before we took off. I suppose one tends to look at eye level and lower during a preflight, and there’s no way to get on top of the wing of a 172M without a ladder (the step on the cowling was added in a later model). Whatever – from now on I find a way to check. In any case, the local Auto Zone was accommodating – for future reference, apparently the fuel cap from a 1953 Ford Pickup fits a Skyhawk, and we flew back fully capped. (No, it’s not official – I will replace it with a real Cessna cap). 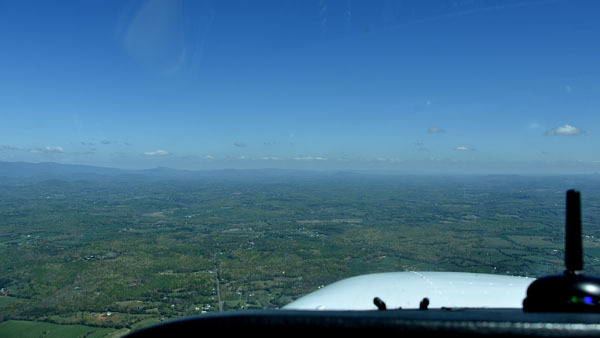 Anyway, the weather was beautiful when we arrived at the airport, and the air was smooth as we climbed up to 3,500 feet. 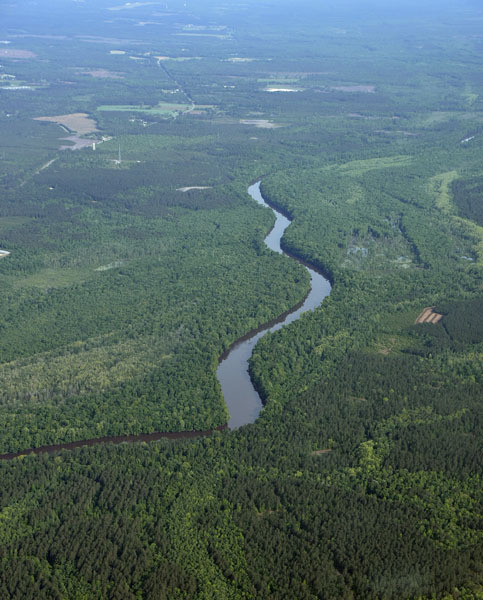 Things are green already down there – this is the Cape Fear River. This is the Bay Tree Lake State Park – I liked the pattern made by the lakes and the canal around the inside of the isthmus (if that’s what you call a piece of land between two lakes). 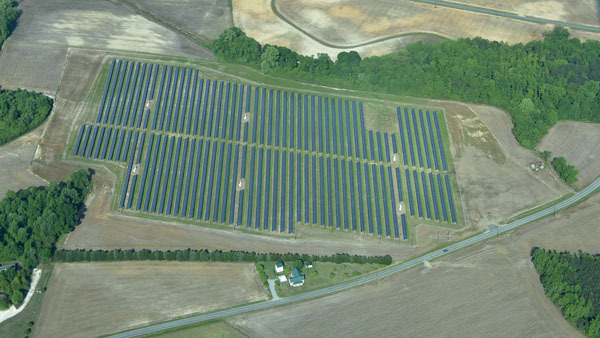 I’ve seen quite a few wind farms this trip, but this was the first solar farm – near Kelly, NC. 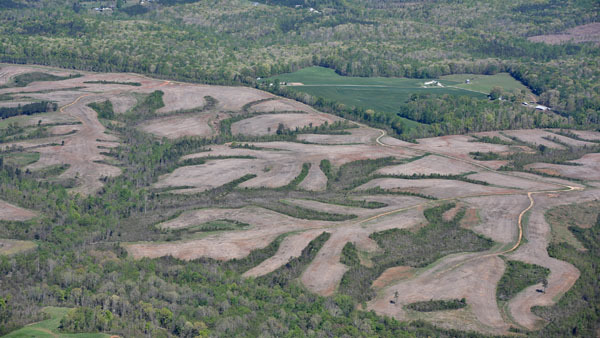 A neat pattern of green bushes and brown fields in Virginia. We crossed Virginia, and the Shenandoah Mountains appeared on the horizon. That marked the highest point in our journey, but we only needed another 500 feet to clear them comfortably. 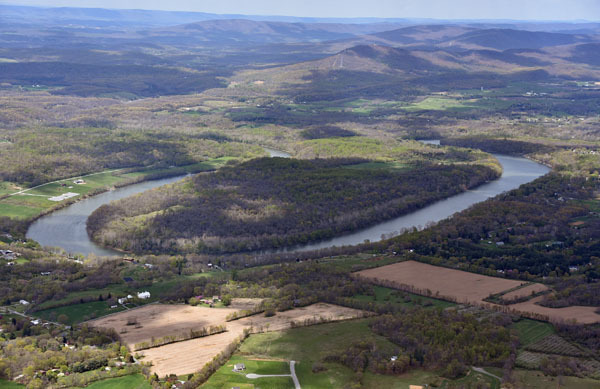 Soon we were flying over the Shenandoah Valley. 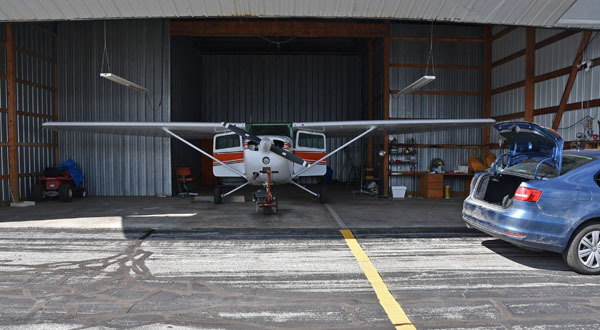 Our lunch and fuel stop for the day was Martinsburg, West Virginia – Eastern West Virginia Regional Airport to give it its formal name, or KMRB. As you approach the airport the three huge grey concrete hangars on the far side of the runway are the first thing you see, from miles away. As you get closer, you see the huge grey jet airplanes parked in front of them. They’re C-17’s, flown by the 167th Airlift Wing of the West Virginia National Guard. 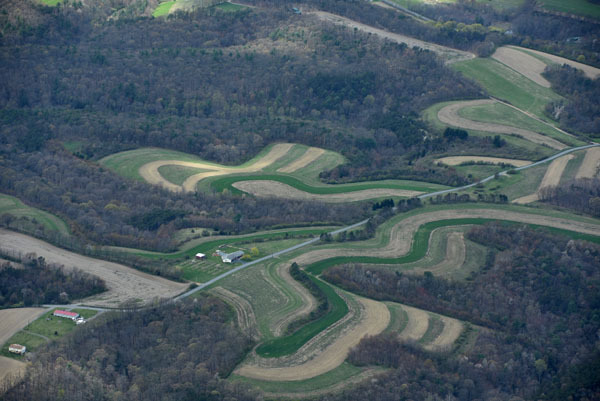 Martinsburg Tower cleared us to land, and we were soon on final. The right-hand or north side of the field, looking westward on Runway 26, all belongs to the Air Force. The FBO is all the way down at the end of the runway, off on one of the narrower taxiways to the left. It’s a newly renovated facility, with friendly staff. They tossed us the keys to a Kia and gave us directions for lunch. For what it’s worth, if you visit KMRB, don’t bother driving all the way to the mall – there’s a little family diner on the left side of Route 11 only a few miles from the airport, and the food is great. There are six stripes either side of the center gap. 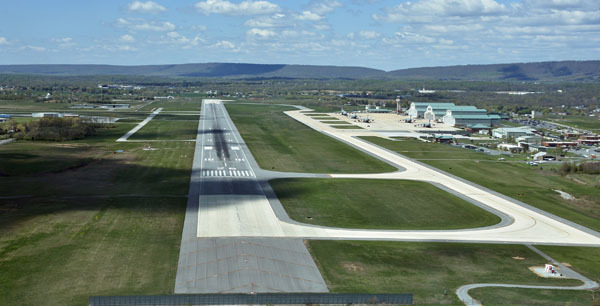 Multiply by 25, and you get the runway width – 150 feet. Sort of neat, actually. After lunch we took off and headed northeasterly – only 200 miles to go from here. In a short while we were passing the Potomac River, and we were in Maryland for a short time. 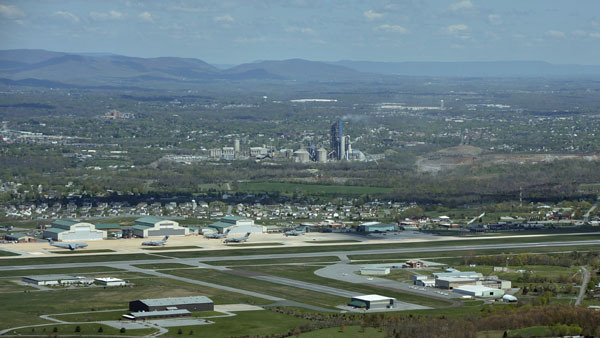 After Maryland, it’s Pennsylvania (Chambersburg, in this picture), and a broken cloud deck formed overhead. We had the deck for the rest of the trip, but it wasn’t a factor, other than signalling a much bumpier ride than we’d had up until then. And, finally… we were home. The totals for the trip were approximately 47 hours flying about 4,140 miles, for an average ground speed of about 88 knots, thereby proving you can do that large a circle around the US and hit headwinds nearly all the way. Still, it was a fantastic trip, and if you’re flying for the flying, who cares if it takes a little longer? Wonder where I can go next? 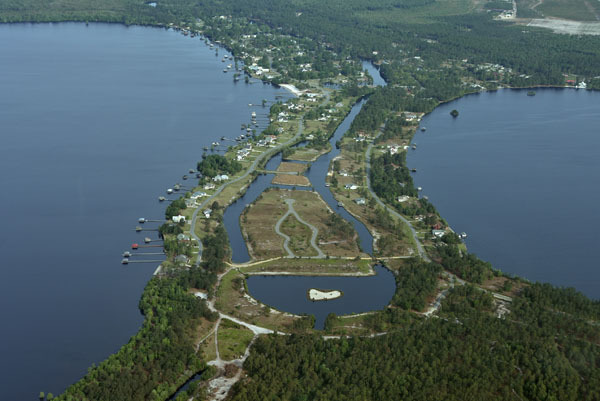 Pingback: By Skyhawk to Florida – Day 7 – Clearwater to Ocean Isle, NC | EHFC Members Talking! Thanks so much for sharing your amazing journey Mike. 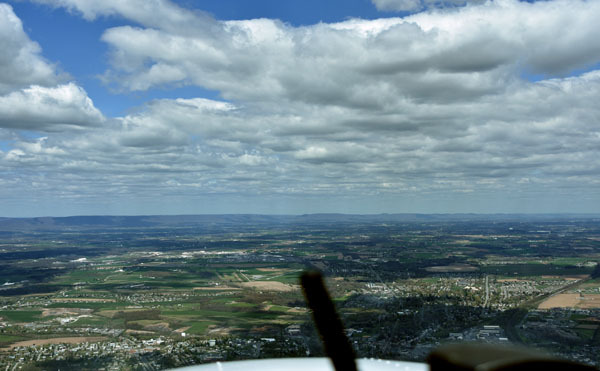 Your travels are an inspiration to all our members…let’s get flying guys!